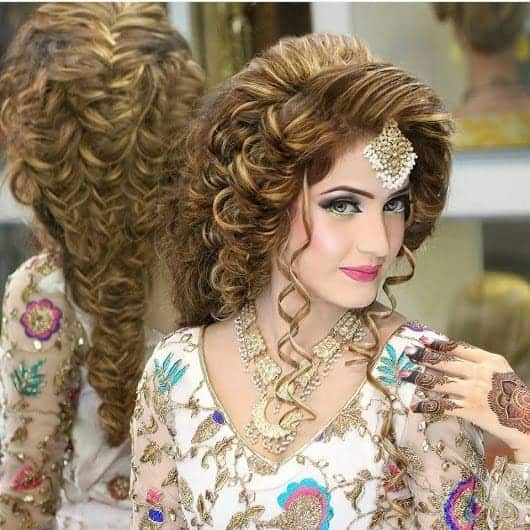 Indian women love long hairstyles when it comes to wedding hairstyle. 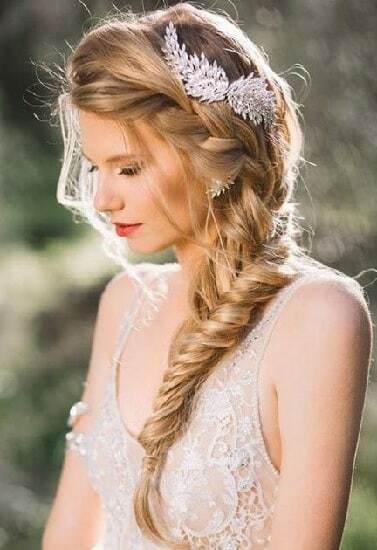 If you are one of those women who get the privilege of a beautiful long hair, don’t miss the chance to style your dream wedding hairstyle! For the bride; her wedding is the most memorable occasion that remains etched, in her heart, and mind. So, for the once in a lifetime occasion, the bride would want to radiate in apparel, appearance, and aura. No doubt, a woman with long, lustrous hair; easily becomes the epitome of elegance, grace, and poise. 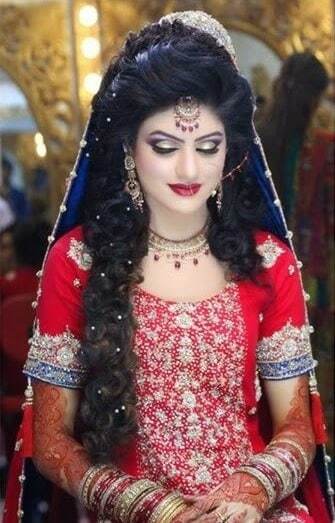 Nonetheless, we suggest taking some extra efforts in hair design, on your special day. 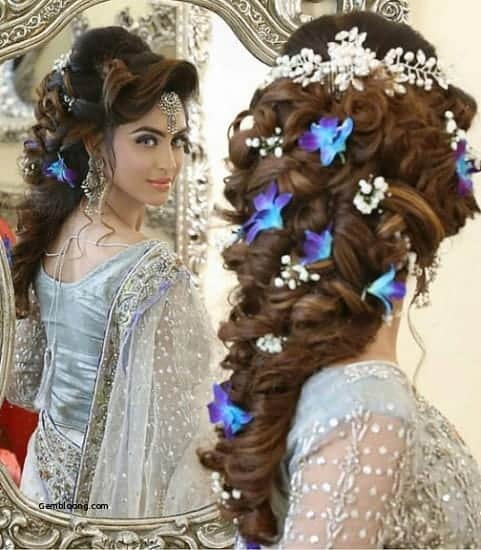 We’ve carefully selected 20 exquisite wedding hairstyles for long hair, for your occasion of a lifetime. 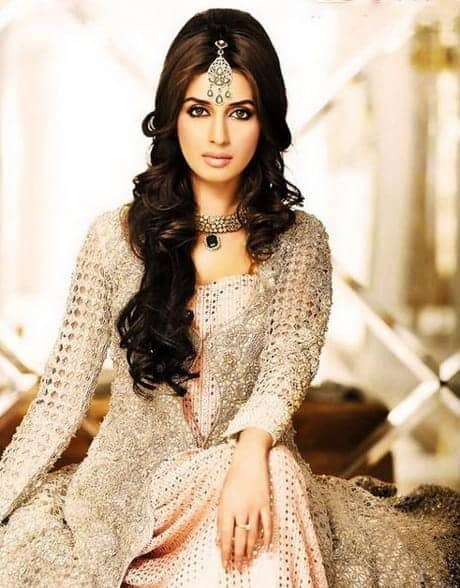 To impart the essence of an elegant bride, choose this gorgeous style. Using heating irons, or flex rods; create lustrous curls on the lower half of your hair. Mid part the hair, brush both sides to the jawline. Sweep the remaining hair back, in a high puff; and allow to cascade backward. Apt for a princess. The entire length of long hair is spiraled and curled. The side parting is deep and swept sideways in a front puff. Two interlaced twists run adjacent to the hairline, folding into the half-up hairstyle. Pinup, and taper the remaining hair to form a ‘V’, at the back. Adorn with accessories. For a gorgeous, traditional braid, use dazzling kundan nagai jada. Ensure the hair is smoothly straight. Mid part the hair. Brush firmly to one side, and secure. Make a large, loose braid. Accessorize to match our bridal gown. 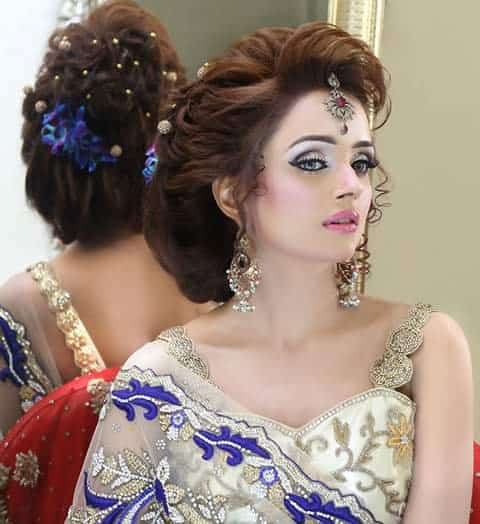 The youthful look for a bride who is young at heart. French plait the hair in a deep side slant, across the head. Brush the remaining hair loosely, to the same side. Make a messy fish plait to the tip. Allow shorter tendrils to wisp around the face. 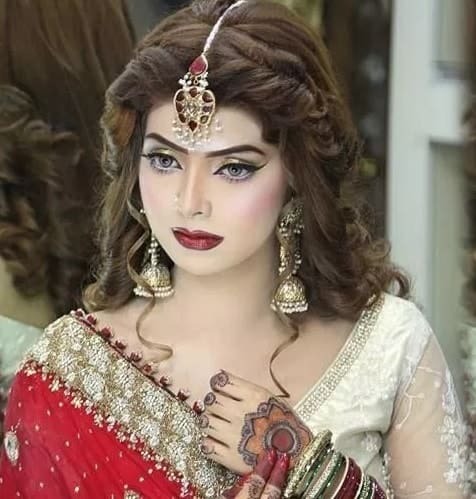 A common wedding hairstyle seen among Indian women. For a classy, elegant look; choose your hair parting preference. Sweep the hair towards the crown, and puff high. Use faux hair to enlarge the bun. 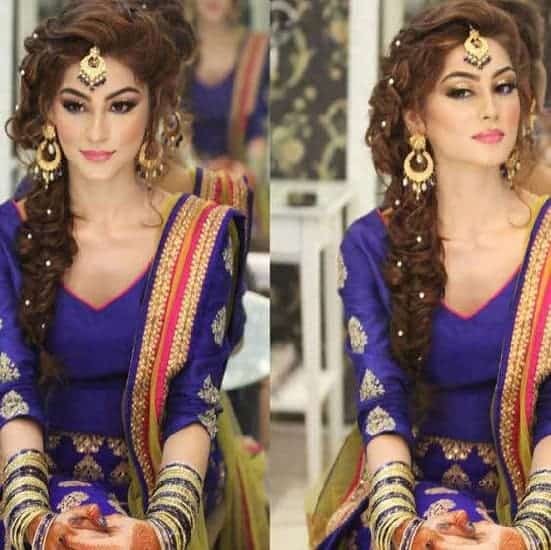 Choose a bun style for Indian wedding, and accessorize. You can choose a bun style to suit your outfit, and face shape. 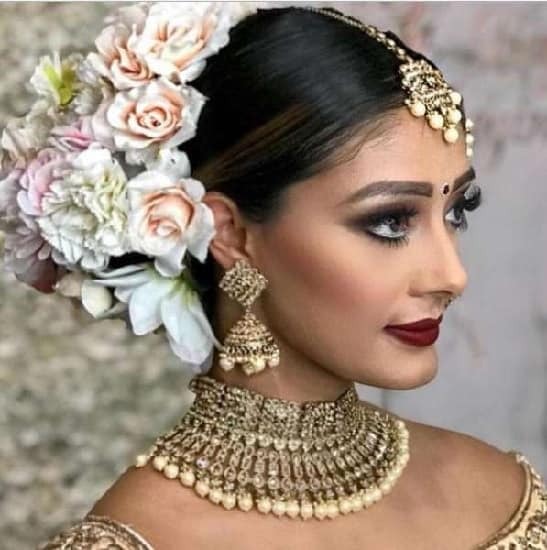 This Indian wedding hairstyle embodies the glamour of Indian weddings. Sided parted hair is puffed forward, and clasped, to one side, allowing a loose tendril, or two- to flow along the face. The remaining hair is puffed high and accessorized. Using a curling tong, create bouncy curls. Pull hair up, and allow the length to flow. A feminine feeling to this hairstyle for long hair. Mid part the hair, and brush sleekly back. Make a neat, firm chignon. 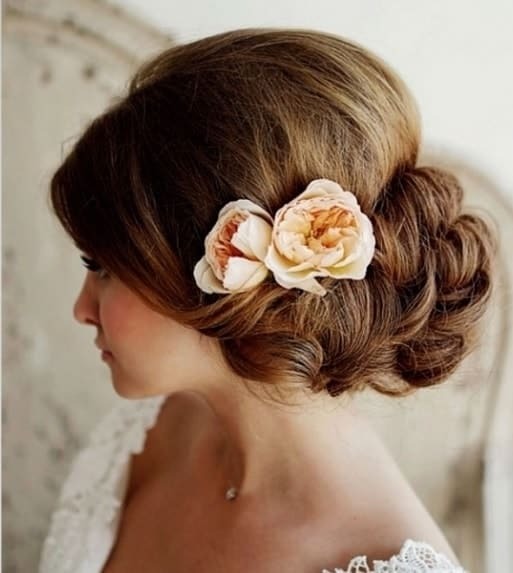 Enlarge the bun with a large garland of fresh flowers, or natural looking ones. We opt for fresh roses, and chrysanthemums, that match the bride’s dress. 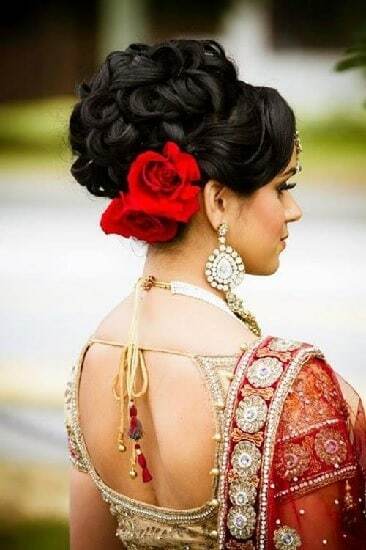 If you are an Indian woman with long hair, this wedding hairstyles should be in your short list! For this very detailed, artistic look; use volume mist to puff up the entire hair length. Side part the hair. Interlace very loose. Braid fish plaits on both sides. Use this technique from the crown as well. Make three large braids. Tease, and pull the braids, to create a large, messy look. Use volume mousse throughout the hair. Side part, and puff up the fringe. Tease the hair back, in an airy, loose manner. Bring the hair at the back, upwards, in an outward roll, to meet at the crown. Create a rose like a bun, and fasten. Adorn with accessories, to showcase a sophisticated look. 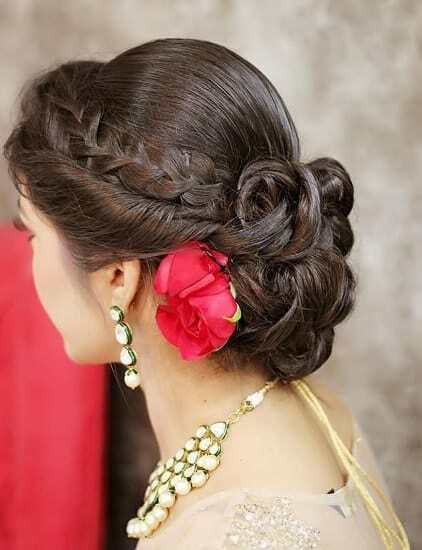 This striking, sculpture-like Indian wedding hairstyle, is simple, but very artistic. With your fingers, create layered ripples from the front covering, swept to the back. A very fine French braid is made all the way to the tip. 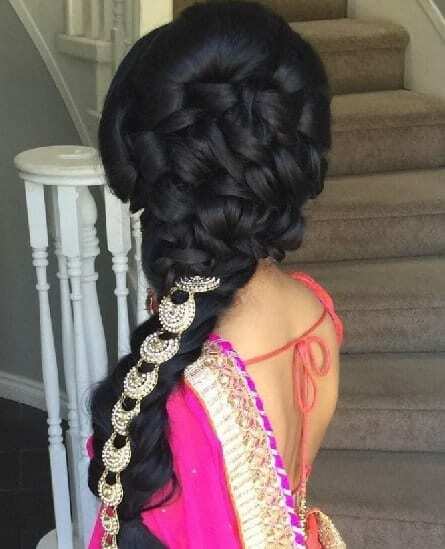 The braid is teased and puffed, to create a cloud-like style around the head. 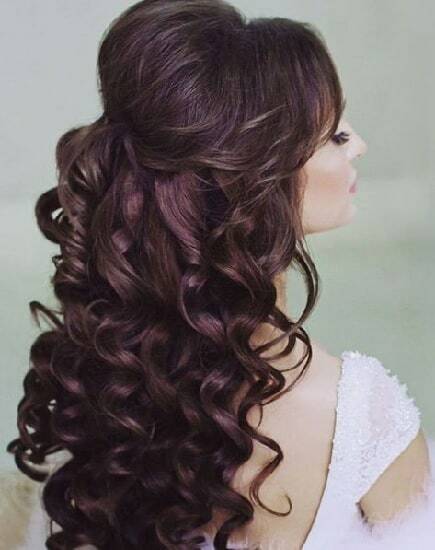 This long length wedding hairstyle is perfect for layered hair, and; if you prefer long locks. Using a curling tong, at the front cover, create long spirals, from the root to the tips of the hair. Allow the spirals to flow loosely around the face. Spiral the remaining layers. A gorgeous alternative to the traditional braid. Create a messy, loose fish plait from the asymmetrical parting. Interlace, and entwine various parts of the hair, into a loose, fine, fish plait. Pull at the plait to create volume. Adorn with accessories. Especially if you have natural locks or coarse hair. Brush your hair into a voluminous puff. Pin half of the hair up. Allow the close, intermingled curls to fall loosely. Decorate the curls with jewels. The elegance of this hairstyle with long hair brims over with virtue. Very gently, with your fingers, pull the hair back. Create vine-like effect, by intertwining, and mingling strands of hair. Pull at the hair to make it voluminous, and messy. Adorn with liana resembling accessories, to emphasize the vine effect. A truly chic chignon, that exudes intricacy. Loosely sweep the hair high up, almost on top of the crown. Allow the layered, shorter layers to wisp around the face. Interweave a large, loose chignon, and accessorize. Faux hair may be used to create more volume. 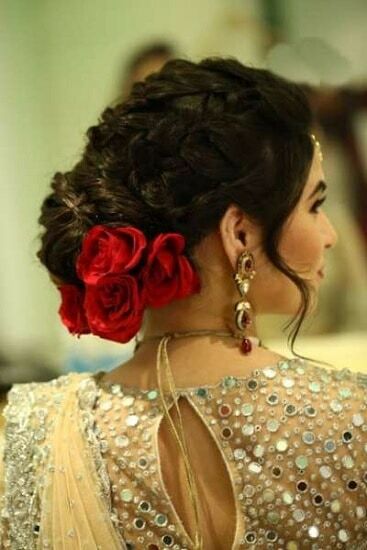 We love the simplicity, but with the elegance of this wedding hairstyle for Indian women. Part your hair in the middle. Curl the hair halfway down the length. Fix the hair in a low, intertwined bun. Allow the side bangs to fall free. The rose bun is becoming very popular for new brides. Part the hair, as you prefer. Allow the front covering to appear full, and rich, with body. Sweep the hair in a slight puff. Style your bun in a rose-like shape, and accessorize. For a ritzy, glitzy style; part your hair to one side. Brush your tresses along the hairline. You have a choice of making a puff, with a lower bun; or piling the larger bun on the crown. You can use faux hair if you have very thin hair, to create depth. 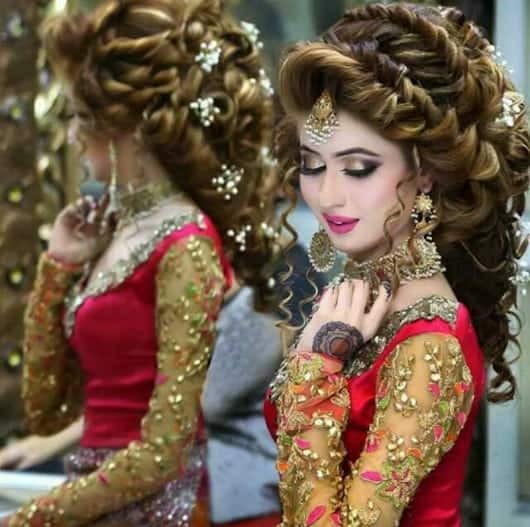 A modern, exquisite Indian wedding hairstyle for long hair. Part two puffs. One from the forehead, slightly back. The other puff, from the first one, and to the crown. Sweep parts of the hair from the sides towards the second puff and secure, very loosely. Allow the gorgeous locks to cascade freely for the remaining hair. For the curly haired girl. Allow your fringe to flow freely. Form a high puff, for the back of the covering, and pin at the back of your head. Allow the long spiral like curls, to fall generously, below. A thing of natural beauty is certainly a joy to behold. For most of the Indian women, one of her most distinctive, notable attributes, is her long, flowing hair. After all, it was made for her, as a covering; as a veil, that radiates the essence of a princess, alongside her prince. 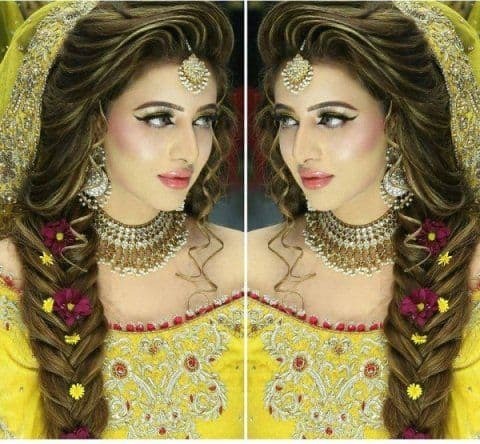 Try any of the above Indian wedding hairstyles with your long hair and get your dreamy day more beautiful!